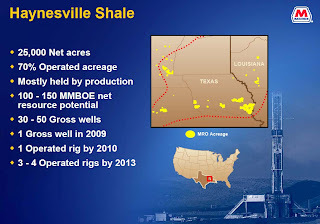 I haven't mentioned Marathon Oil's presence in the Haynesville Shale before because the company has been very quiet. It leases 25,000 net acres (70% operated acreage), mostly on the Texas side, but it also has some leases in DeSoto Parish, LA. The acreage is mostly held by production, so the company is not in a big hurry to drill. Marathon is a big integrated company that participates throughout the oil and gas value chain, from exploration to retail sales. It has projects all over the world, and the gas shales are a pretty minor part of the big picture. Marathon clearly is an oil company first. It characterizes its resource potential for the gas in the Haynesville Shale in MMBOE, or millions of barrels of oil equivalent. Marathon has only participated in one well so far and doesn't expect to have a rig in the play before 2010. It expects to have three to four rigs by 2013. Definitely not in a rush.